Steve Schaefer, owner of Sonoran Steel Fabrication is local to me and brought over his 8.4" 3rd with the girdle brace on the top. He also brought over a brand new Truetrac and a solid collar. 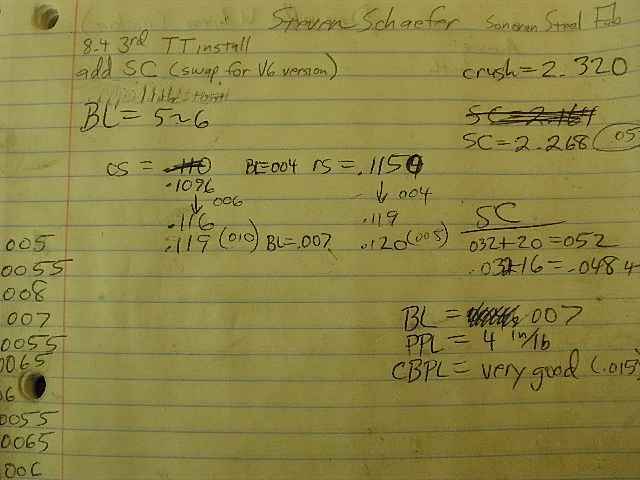 The mandatory first step is to get a backlash check...it was averaging between 5 and 6 thousandths. Although not needed, I also ran a pattern check. Coast also looks good. 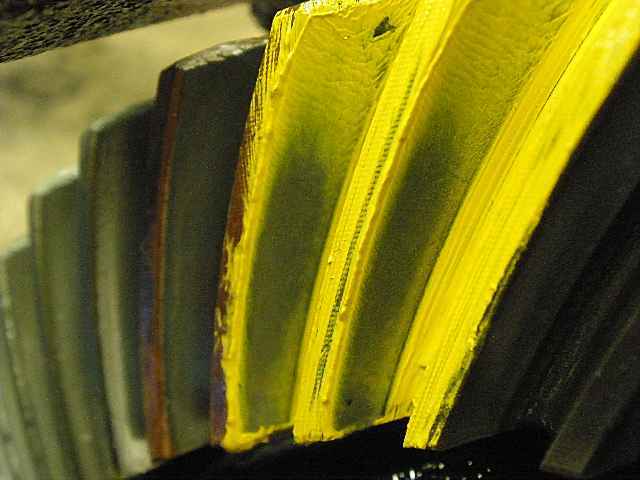 As already mentioned, this paint check is optional...the pinion was not wobbly, the ring gear was not wobbly and I got exactly what I expected to get - a normal looking drive/coast pattern set. 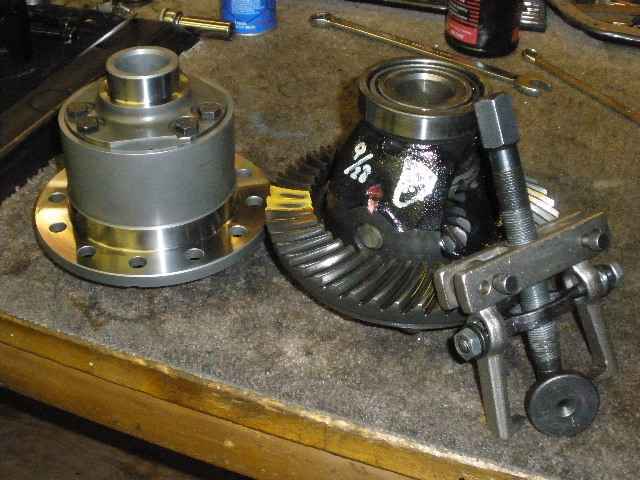 Remove the 4 long 17mm bolts and the bearing cap girdle comes off. 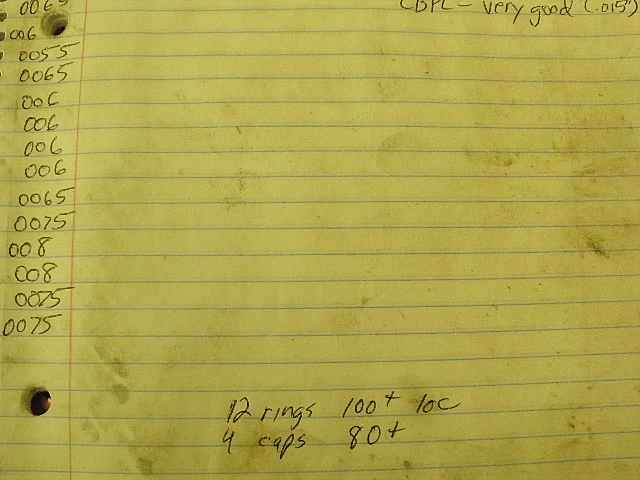 Steve's truck only has 20k on it so there was still some CBPL left and the washers required light taps to remove them. 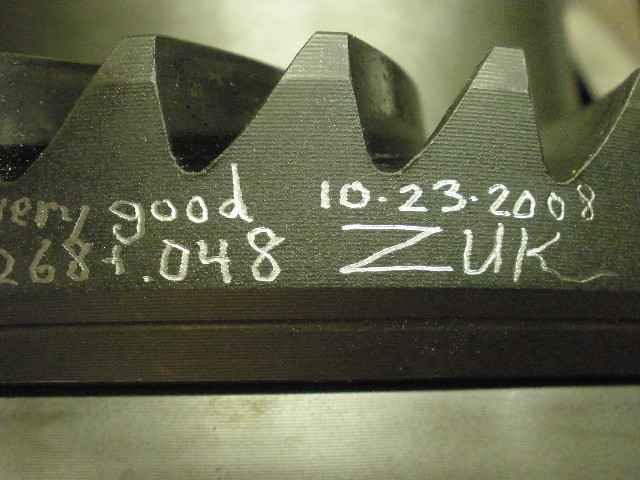 Still, I will probably end up adding between .005" to .015" to this shim pack upon re-installation. This will renew the CBPL and add strength by reducing ring deflections under severe torqing. Here, Steve checks the PPL. 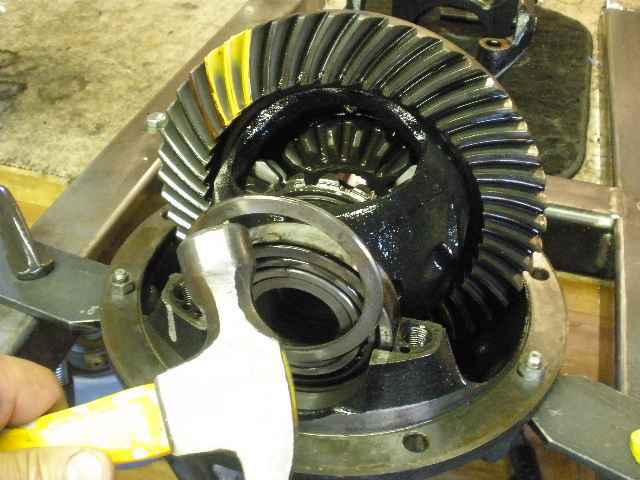 There was a slight drag but that was probably due to the pinion seal rub. There will be between 3~6 inch/pounds of PPL when the solid collar is installed. Only a couple pictures of this part of the operation and that is to remove the crush sleeve then install a solid collar with a new seal. 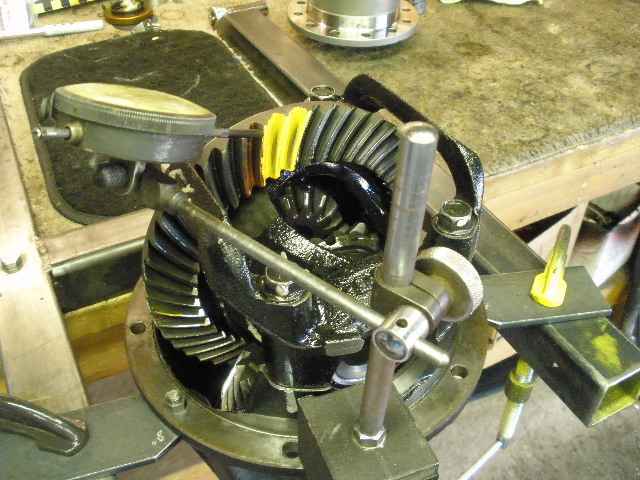 The 30 spline flanges always seem to be a very snug fit onto the pinion splines and this is where the 2 jaw puller comes in handy. 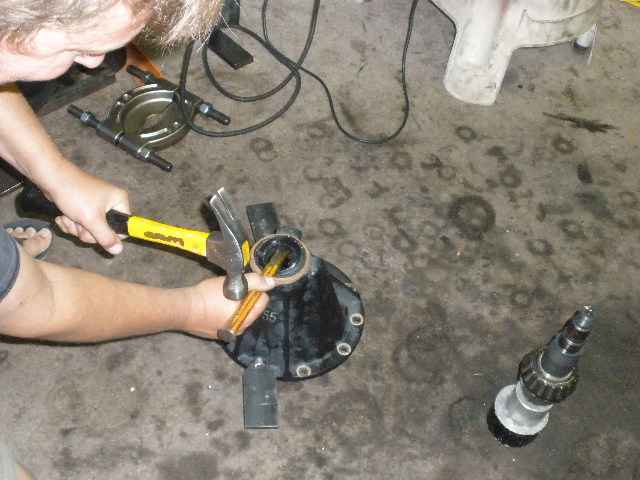 The seal is removed and a new one will replace it. Steve measures a shim that will be used on the solid collar. After comparing the old crush sleeve with the new solid collar, a good starting shim was tried and, on the second try, we nailed it down with 4 inch/pounds of PPL. Key to saving and moving the fairly new bearings (20,000 miles) over to the new Truetrac is a good 2 jawed bearing puller. This one is hard to beat. These buggers were on tight. 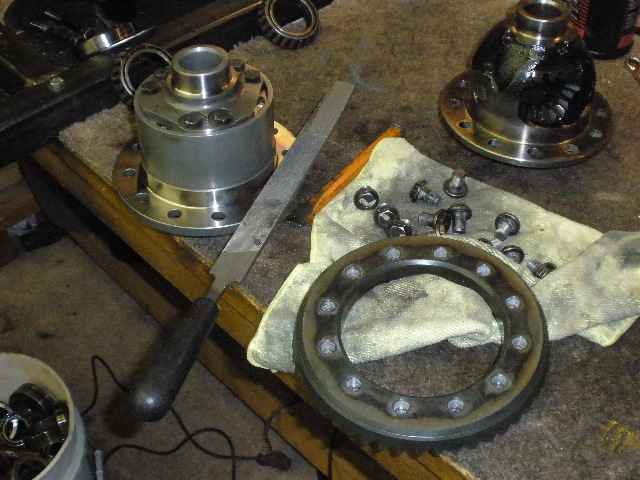 Good luck trying to get these carrier bearings off with some other 'make-do' tool like a hammer and chisel...it won't happen. 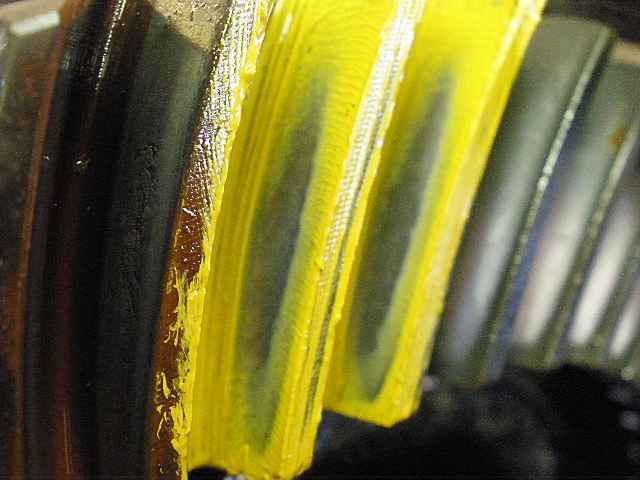 And the ring gear would also have to be swapped over...the factory loctite makes them a challenge to remove. 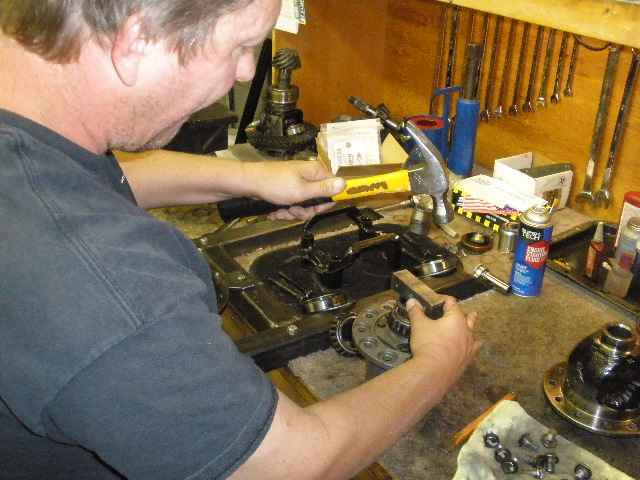 ...we will get the carrier bearings out of the way and tap them on right now. The ring is now installed. 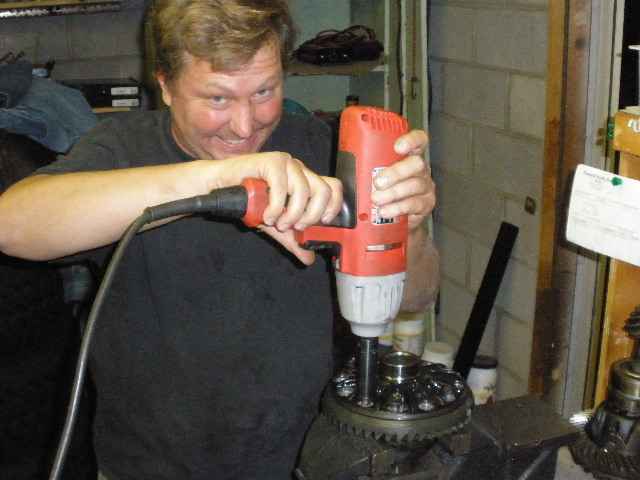 Red Loctite and 100 f/lbs. 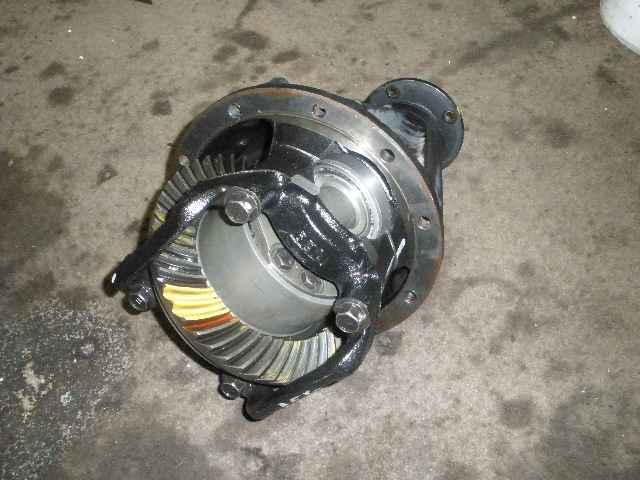 The case and bearing cap girdle can now be installed and the BL measured a too tight .004". The CBPL was in need of more shimming on both sides, too. We started with .109" on the case side and ended up with .119 for an increase of .010".... On the ring side, we started with .115" and final was .120" for an increase of .005". 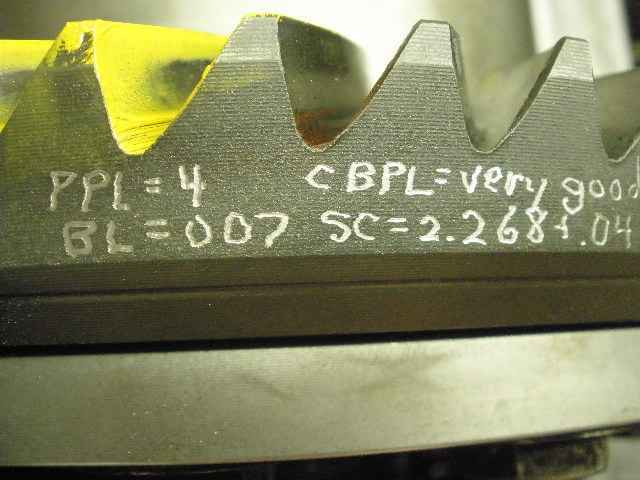 This means that we have effectively increased the CBPL by .015" in increased shimming while, at the same time, guiding the BL in the desired direction for a final lash of .007". 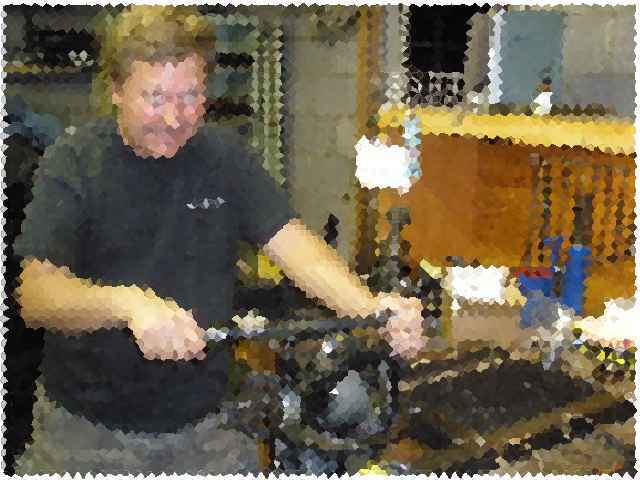 Not sure what happened to this pic but Steve appears to be totally pixilated....perhaps a result of all the shim math. 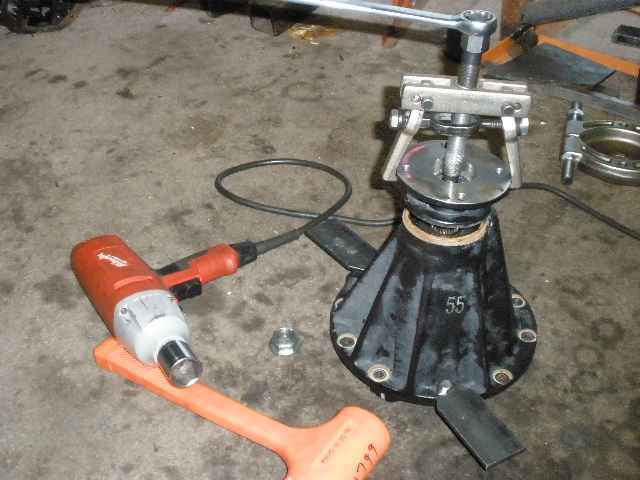 In any event, the 4 bolts on the girdle are now torqued to 80 ft/lb and this 3rd is now done. What we have here is renewed PPL with a new seal....added the Truetrac and have also renewed the CBPL while keeping the factory BL in the same range. Notes kept during the process.